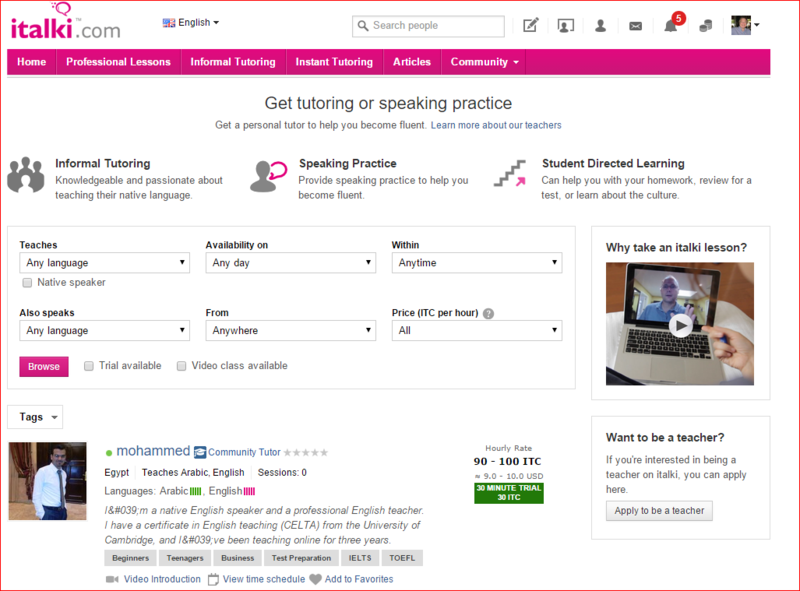 Italki is an online exchange which connects language learners with native speaking conversation partners and/or teachers in any of 124 languages. The platform facilitates reading, writing, speaking, and listening in whatever language you choose, as well as prompt correction and/or reinforcement. Language partners. I originally joined Italki to find language learning partners who want to learn English and are native speakers of the language I am learning. Italki helps make those connections. You can easily filter prospective conversation partners worldwide by what language they speak, what language they are learning, and what country they are from. After reviewing profiles to see their pictures, words of introduction, and fluency level, you can send friend requests, exchange written messages, and/or continue your discussion via VOIP or Skype. I’ve enjoyed both written and Skype exchanges myself with several partners from Mexico and Columbia. Remember this is an exchange; plan to spend as much time helping them to learn your language as they invest helping you with their language. Notebook. By clicking notebook, you can write entries in your own notebook in your target language to be reviewed and corrected by native speakers. Or, you can review and correct entries in your own native language to help people learning it. So, for example, before my first actual conversation on Italki, I wrote out an introduction of myself in Spanish; within a few hours I received corrections from three native speakers. Question/Answer. 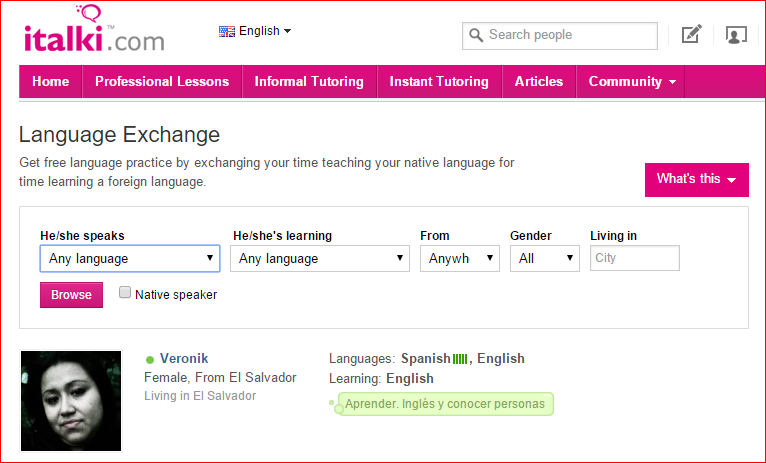 Here you can ask questions about the language you are learning or answer people’s questions about your language. Discussions. These are threaded discussions which you can read and to which you can contribute. The following three tabs are premium functions; you pay in Italki Credits (ITCs) which are pegged to the U.S. dollar (10 ITCs = $1.00). Informal Tutoring. Informal tutoring is primarily to practice conversing in your new language, though tutors may also help you with homework, review for a test, or learn about their culture. Once you’ve chosen a tutor, it’s time to set your first appointment. Just follow these steps: Click view time schedule, click schedule session, choose length of session, select day and time from list of openings, then save, and confirm. A request is sent to the tutor/teacher immediately and, in my experience, they respond within a few hours. Then, just be ready for your Skype session to begin. Instant Tutoring. Instant tutoring is similar to the above, except that you are choosing from a smaller pool of teachers/tutors – those who are available right now. Except for beginning from the Instant Tutoring tab, the steps are the same. Professional Lessons. Professional lessons refers to a more formal process, taught by professional teacher (not community tutors), following structured lesson plans or materials prepared by the teacher. This is more like taking a class, albeit a class of one. I really haven’t encountered any negative factors. True, you may not share an immediate rapport with the first exchange partner, tutor, or teacher you try, but italki suggests you try out several. Italki positions itself to help beginners through intermediate language learners (A1-B2) in any of the 124 languages currently supported. Community Tutors are simply native or near-native speakers who are 18 years old or older and enjoy teaching informally. Professional Teachers have “been trained in foreign language acquisition, teach as a job at a school or language institute,” and have both “a university degree in education” and “a teaching certificate (i.e. TESOL). Tutors and teachers set their own hours and prices; Italki handles marketing, scheduling, management, currency exchanges, and payment. Italki provides a very thorough knowledge base which has covered every question I have had about Italki. In addition, you can submit requests for support. 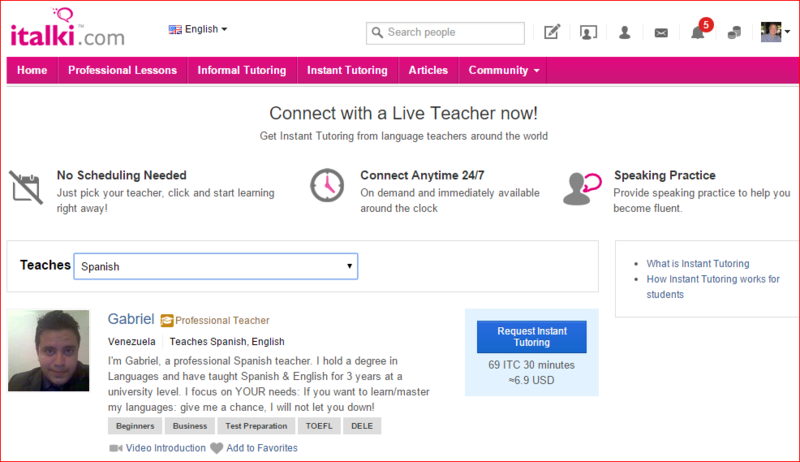 As mentioned above, tutors and teachers on Italki set their own prices (of which Italki receives 15%). Sessions are 30, 45, or 60 minutes in length. It’s quite easy to find 30 minute sessions for $5-$10, though I’ve seen teachers who charge rates from a low of $4/hr to a high of $79/hr. Remember, you can also do languages exchanges free – spending half the time learning their language and half coaching in your own. I’ve checked out professional teachers, community tutors, and free language exchange partners and had good experiences with all of them. I heartily recommend Italki to anyone learning a new language. Italki is a powerful language learning tool! It brings you into close contact with native speakers and their culture without even leaving home. Even if you stick to the free community features, you can benefit enormously. If you choose professional lessons or informal tutoring, you’ll receive that much more. Why not check out Italki for yourself now? This is a great business idea. I am native English speaker and have no qualifications in tutoring or anything like that, but I would be really interested in becoming a community tutor. (I had parents who rigorously enforced correct grammar and spelling etc) – sounds fun huh!? So this is something I feel I could help with. I know you said they set their own prices, but do you have a rough banding of prices? ie what is the lowest to the highest at the community level? I looked into that myself today and found that English was one of the very few languages in which Italki does not need tutors at this time. However, I still looked at the banding of prices you asked for. Most teachers of English I found were professionals. However, in the first three pages of teachers of English, I did find 12 community tutors charging from $5-$25/hour. Only four charged more than $10/hr, and they were from the UK, Sweden, & Denmark; the three charging least ($5-$6/hr) are from China and the Philippines. .
My first language is French and since I am a premium member in WA community I need to write a lot in English. This article could be a wonderful solution to develop the spelling as well ! Thank you, Daniella! Yes, Italki could be a real help for you by submitting your writing in a notebook for others to correct your English. You could improve your English as a language partner with someone learning French. You could find a tutor if you’re willing to pay. Or, you might want to check and see if there is a need for French tutors. Thank you for this post on a really awesome service. My wife and I are getting closer to retirement, we have discussed after a lot of research moving to Ecuador for our Golden Years. Our biggest stumbling block would be the fact that neither of us speaks any Spanish. What I found immediately after going to italki, was how easily I could find a native speaker and even search by country. Glad to be of help! There are some great retirement opportunities in Ecuador. I encourage you to follow through with Italki.